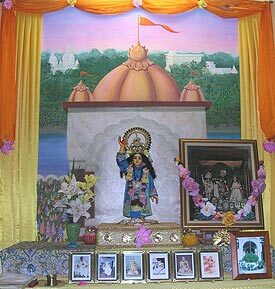 Sri Chaitanya Saraswat Seva Ashram San Jose, humbly tries to represent the exalted Sri Chaitanya Saraswat Math. In this oasis within Silicon Valley, residents and guests hear the message of Sriman Mahaprabhu in the pure devotional line of Srila Bhakti Sundar Govinda Dev-Goswami Maharaj and Srila Bhakti Raksak Sridhar Dev-Goswami Maharaj, and get the opportunity to engage in loving service to them. We have a brother ashram in Soquel, CA, near Santa Cruz.